It all started a couple of years ago on the roof of Africa. Uhuru Peak, 5,895 m. This peak is one of the emblazoned Seven Summits, the highest peaks on each continent. So, let’s go, Mount Elbrus, 5,645 m in the deep Caucasian Russia, at the Georgian border, the highest peak in the continental Europe. This time let’s try differently, alpine style, without porters, no support, with the tent and climbing the famous North Face. Once landed at Mineralnie Vody and after three hours driving with a Jeep, among breathtaking views and dirty roads in the middle of boundless spaces and uncontaminated grasslands, we arrived at the Base Camp at 2,600 m. Left by the Jeep, the was the sun low at the horizon while the grazing cows were looking at us in our slow progress with a 25 kg backpack on the shoulders and a 15 kg one on the belly. At the sunset, the first thing to do is to cross a river through a Tibetan bridge in order to, finally, pitch the tent for the first night. The fog rises, the Elbrus cannot be seen, we have dinner in between the clouds and we slept for the first night in order to let the adventure begins. Await us, a morning with kilometers and fatigue, the idea is to climb directly to the High Camp 3,700 m but, with 40 kg on the shoulders, we understand immediately that cannot be reached in one day. Thus, we decide to have a Camp 1 at 3,100 m in a big lawn close to a small river from the glacier, just below the Mushroom Rocks (around 3,200 m). Another up and down from the Base Camp to Camp 1 since, in “one shoot” it was impossible to carry all the stuffs, the decision to climb Elbrus without any help has been taken while before and this is one of the effort to do. Once pitched the tent, let’s go for a short walk to the Mushroom Rocks, some big mushroom – shaped stones that dominate the plain below. Lunar landscape! The light gives way to darkness and also the tent is tinged with golden colors of the sunset until it becomes completely black. Illuminated by the headlamps, we stay a little bit outside to breathe the sizzling air of the sunset just past and, then, we go to sleep thinking about that peak white tinted that dominates us from above. During the night, a light storm cools (even if there was no need) the atmosphere in the tent, but the next day, is made of a red sun like a fire that illuminates the two peaks (East and West) of a warm orange color even if, at the top, there are 50 km/h winds and several degrees below zero. 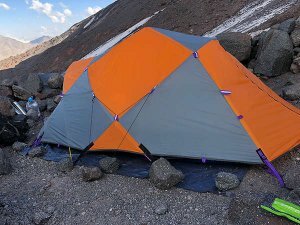 The goal of the day is to reach the High Camp (or Camp 2) at 3,700 m. After an heavy breakfast, the tent is unpitched and loaded into the backpacks. The journey starts immediately with a ramp of 100 meters and steep slopes until soften slightly, will follow then few kilometers in the quite flat in order to arrive to a two ramps very tough between 3,450 m and 3,700 m. It starts to be visible the glacier, the wind gets more and more strength and the altitude makes the backpack even heavier. Step by step we reach Camp 2 in front of the gigantic Elbrus glacier that show itself in all its beauty and impressive size. The tent is pitched on the rocks in front of the glacier and, after a substantial lunch, let’s go back to Camp 1 to take the remaining part of the stuffs left there in the morning. The hours pass while, with slow steps, we followed the same path made in the morning. The shoulders and the neck begin to hurt but we are all aware that Camp 2 is the “starting point” of the top of Europe. There will be no other up and down in the future, it’s done!. At the 6:00 pm, everything has been transferred and we start to cook something with our camp stove and gas bottle. The hot polenta and mushrooms (typical Piedmonts dish) brought with so much efforts for this occasion, help to warm the body and the brain along the cool evening and, the herbal tea made by heating the water from the glacier, help to enter into the arms of Morpheus for the night. At night there is a strong wind, typical of the area, and the tent, well-pitched, seems to be the winner of the battle. The following day is the first day of acclimatization. You cannot think of conquering a peak above 5,000 meters without even be acclimated, the goal is about 4,600 meters at a point called Lenze Rocks. They are a series of monoliths separated from each other by about 400 meters in altitude where it is common to acclimatize. We choosed the lowest one at about 4,600 meters and, then, we continued slightly higher at 4,700 m to see the track on the glacier to be traveled to the top. The body responds well and the mind is in perpetual ecstasy seeing the top so ”near” at not more than 1’000 m in altitude, which however means another 6 hours of walking at least in such altitudes. We eat something there and contemplate the horizon, this also helps the body to get used to the height prior to return to Camp 2 where we left the rope, ice ax and crampons to dry on the scorching stones in the sun. The departure to the top is usually in a window between 00:00 and 03:00 am, we talked to other climbers, who are preparing for the night climb, and we shared a thousand alpine experiences, we had dinner and get ready to go to sleep with the inevitable tisane. It is important to drink a lot and eat properly to have energy and not suffer from the so-called altitude sickness. The weather forecasts do not promise well for the following days but we have begun to understand that it is not always been exact since the Elbrus does a little bit of what it wants. Within 5 minutes you could go from a hot sun, to a cold wind, so we do not decide when to attack the summit and and we preferred to wait for the new bulletin the next day. We had lunch and we went immediately to the tent to rest because the alarm has been set at 11:30 pm. Here came dinner and even darkness, the afternoon clouds left room for a resounding sky, “ah if I could have here the telescope” … the Milky Way embraces the East and West summits and, the stars of the firmament, looked at us like little ants trapped in our dreams. … it’s time … this is the day for which it has been expected so much, and so much effort has been made up to now, out of the tent, the eyes, instantly became accustomed to the darkness, the starry dark sky was in contrast with the pure white of the ancient ice…breakfast, the tent is closed, the crampons are on the feet, the satellite and the headlamp are on, the rope is tied and the ice axe is on the glacier. It starts! 2 o’clock at night, the icy wind freezes the face when, from the satellite, you hear the ‘beep’ that indicates the exceeding 4,000 meters, raising your head you begin to see the two twin peaks that are covered with clouds… let’s go on … 4,200 – 4,500, the dawn begins on the peaks all around, the wind is getting stronger and both peaks of the Elbrus are covered by the storm … the sun peeps over the stratified clouds and begins to illuminate the ice with a shy red-orange color. At 4,800 meters, and after 4 hours of progression on ice, the wind becomes too strong and becomes very difficult to continue also because, to get to the top, there are still 6 hours of walking and about 4 hours to return to Camp 2, the weather forecasts are not good at all and it is useless to continue towards bad weather at those altitudes. Visibility is fundamental and we also saw several roped groups, left few hours before us, give up. It is therefore decided to go back. Going down, the weather did not improve at all and the cold becomes more and more pungent, but the view is fantastic and the clouds have not yet arrived on the surrounding peaks, it is incredible to observe all the mountains around the Elbrus that, as in a big hug, they surround it. On 4,000 – 4,200 m the temperature becomes a little more bearable and we decide to sit down and contemplate the landscape for a few minutes (also because a bit of exhaustion). It’s 9 am, the sun is high and it’s “quite” hot, looking towards the peaks, the storm continues to leave no respite and we think that the choice was right also because, the weather, is getting worse and worse. Calmly, we went back where our adventure is coming to an end, we would still have had a day to try the summit but, a slight ice mixed rain, began to fall slightly and then more and more thicker, rain that remained above our heads for the next day. We then decide to un pitch the tent go back to the Base Camp where, a week before, it all started. Surely, the goal was to get on the top of Europe but, you know, it is the mountain to decide when to climb it and must, therefore, be respected. This experience has served to get to know the environment and understand the ”rhythms” of the Elbrus, we left this fantastic landscape with magnificent moments in our eyes after a fantastic adventure … goodbye Elbrus, and thank you for an unforgettable experience.